Chicken liver mince(pre-clearing from the film and tendons.In the liver add 4 eggs,Cup of flour(I have 200 grams,150 grams of milk,salt and pepper to taste.Mix well and add to the liver 100 grams of vegetable oil.I always fried liver pancakes on two pans. One pancake is the size of 22 cm,the other larger.One side is fried in one pan,then flip the pancake to the other pan of the other party,so I avoid «breaking»of the pancake.In the mayonnaise to your taste, add the garlic passed through Chernogolovka. 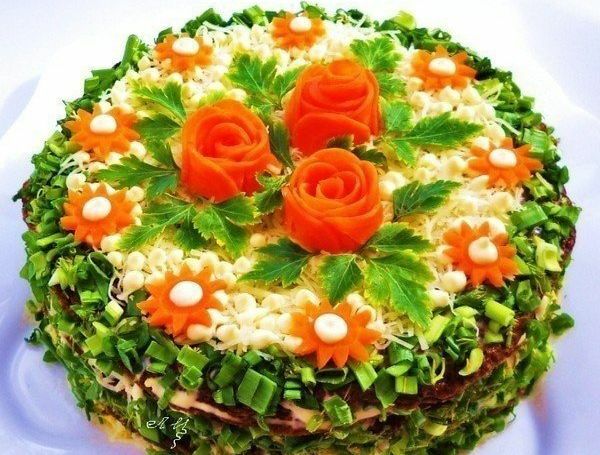 Now grate the carrots,chop the onion into cubes and fry in a little butter until Golden brown.Pancakes from the liver stacked on each other promazyvaya each layer with mayonnaise with garlic,I smear a very thin layer so as not to kill the taste of the liver. When will be laid all the layers,top coat with mayonnaise,and hands pressed to put fried onions and carrots.